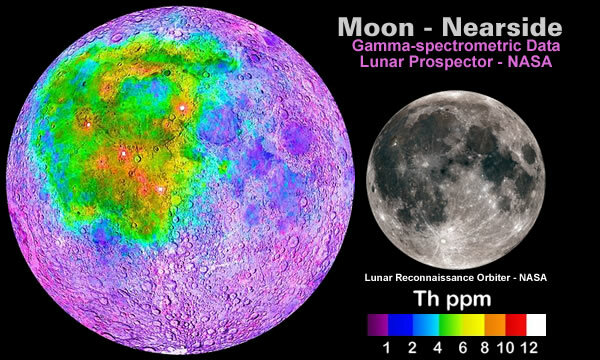 One of the more surprising lines of enquiry into the origins of Terrestrial Thorium is the esoteric narrative of the Thorium enriched KREEP deposits on the Nearside of the Moon. 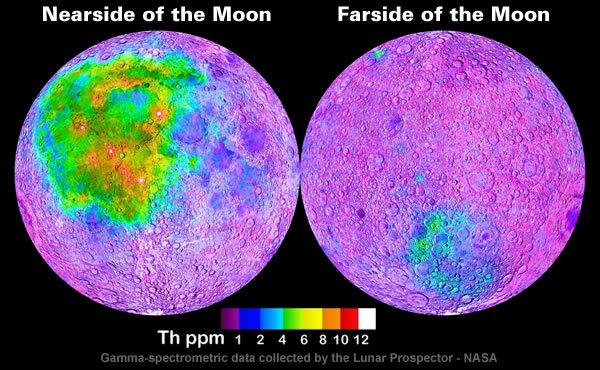 The remarkably unbalanced distribution of Lunar Thorium mirrors the equally unbalanced distribution of Lunar Maria on the Near and Far sides of the Moon. Almost all maria are on the near side of the Moon, and cover 31% of the surface of the near side, compared with 2% of the far side. Once upon a time the mainstream asserted the Lunar Maria actually held water. 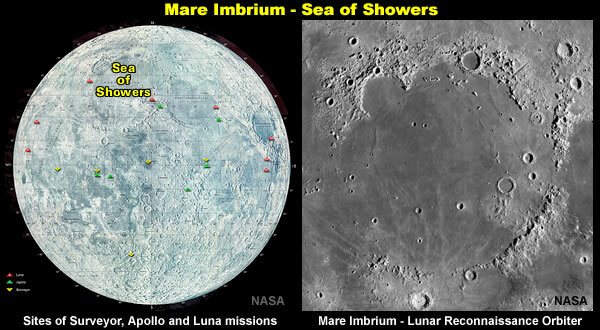 The lunar maria… were dubbed maria, Latin for “seas”, by early astronomers who mistook them for actual seas. Nowadays, Lunar Maria, like the Sea of Showers, are said to be vast lava plains. Mare Imbrium (Latin for “Sea of Showers” or “Sea of Rains”) is a vast lava plain within the Imbrium Basin on the Moon and is one of the larger craters in the Solar System. The Moon’s maria (plural of mare) have fewer features than other areas of the Moon because molten lava pooled in the craters and formed a relatively smooth surface. But even this Space Age narrative for the Sea of Showers has more than a few issues. 1). The Sea of Showers is “not as flat” as it should be. Mare Imbrium is not as flat as it was originally because later events have altered its surface. 2). The Sea of Showers is actually a sea of sand. Over time, these impact processes have pulverized and “gardened” the surface materials, forming a fine grained layer termed “regolith”. The thickness of the regolith varies between 2 meters beneath the younger maria, to up to 20 meters beneath the oldest surfaces of the lunar highlands. The term lunar soil is often used interchangeably with “lunar regolith” but typically refers to only the finer fraction of regolith, that which is composed of grains one centimeter in diameter or less. 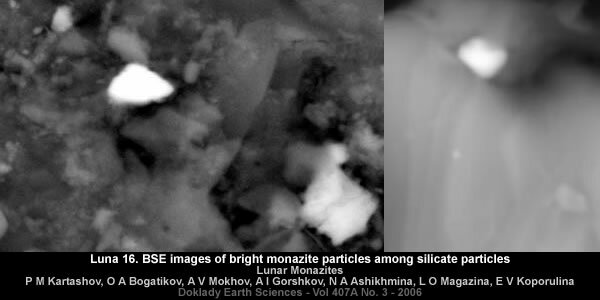 Lunar dust generally connotes even finer materials than lunar soil. There is no official definition of what size fraction constitutes “dust”; some place the cutoff at less than 50 micrometres in diameter, others at less than 10. 3). The sea of sand forming the Sea of Showers is enriched with Potassium, Rare Earth Elements, Phosphorous, Uranium and Thorium [KREEP]. The gamma-ray spectrometer data shows that the rocks rich in potassium, rare earth elements and phosphorus, known as KREEP, are concentrated in the Mare Imbrium rim, the nearside maria and highlands near Imbrium and the Mare Ingenii South Pole-Aitken basin and are distributed at a lower level in the highlands. KREEP is rich in uranium and thorium and is thought to represent the last remaining melt after the lunar crust formed. KREEP, an acronym built from the letters K (the atomic symbol for potassium), REE (rare-earth elements) and P (for phosphorus), is a geochemical component of some lunar impact breccia and basaltic rocks. The typical composition of KREEP includes about one percent, by mass, of potassium and phosphorus oxides, 20 to 25 parts per million of rubidium, and a concentration of the element lanthanum that is 300 to 350 times the concentrations found in carbonaceous chondrites. 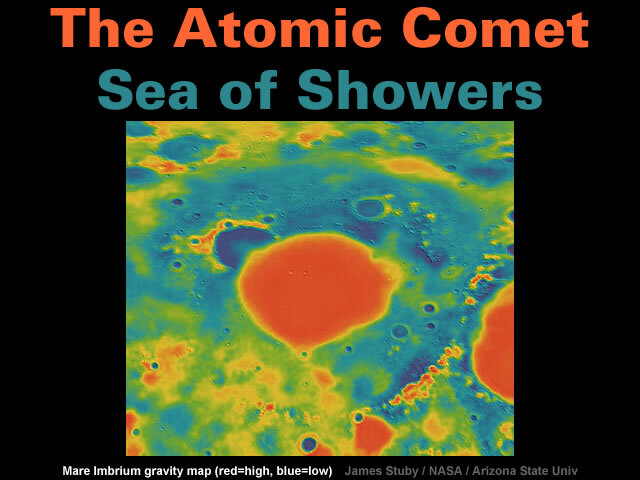 However, the measurements from the gamma-ray spectrometer on-board this satellite showed that the KREEP-containing rocks are primarily concentrated underneath the Oceanus Procellarum and the Mare Imbrium. At this juncture in the narrative the mainstream “deduced” the KREEP deposits originated from within the Moon which – in it’s turn – originated from within the Earth. Indirectly, it has been deduced that the origin of KREEP is contained in the origin of the Moon. This is now commonly thought to be the result of a rocky object the size of Mars that struck the Earth about 4.5 billion years ago. This collision threw a large amount of broken rock into orbit around the Earth. This ultimately gathered together to form the Moon. Today, the giant impact hypothesis is widely accepted by the scientific community. However, these mainstream deductions only add to the problems. 4). The sea of sand forming the Sea of Showers is also enriched in Iron with the frequently forgotten black-coloured Ferrous Oxide content reaching 16% i.e. at least twice the level it should be if the Moon originated From Below in the Earth. Iron(II) oxide or ferrous oxide is the inorganic compound with the formula FeO. Its mineral form is known as wüstite. One of several iron oxides, it is a black-colored powder that is sometimes confused with rust, the latter of which consists of hydrated iron(III) oxide (ferric oxide). Oregon State University – Volcano World – What is lava made of? 5). The very low Total Magnetic Field strength associated with the Sea of Showers is more suggestive of a superficial coating of iron enriched dust than a vast crater filled with iron rich lava. 6). The sea of sand forming the Sea of Showers is also enriched in Titanium with the frequently forgotten bright white Titanium Dioxide content reaching 10% i.e. at least five times the level it should be if the Moon originated From Below in the Earth. Image taken by the Clementine probe (415 and 750 nm) showing the concentration of Titanium on the surface. Note the high concentration in the seas and what is rare in the highlands. 7). The source of Lunar Thorium [peaking around 12 ppm] is also very difficult to explain away. The source of the thorium enrichment is actually not well understood. 8). The “deduced” internal structure of the Moon contradicts the observational evidence indicating the Moon contains a resonance chamber that causes it to ring like a bell. On the 20th November 1969 a percussion test was performed on the Moon when “the Apollo 12 LM hit the lunar surface at 6,048 kilometers per hour, 72 kilometers from the landing site, digging an estimated 9 meter wide crater”. a) The resonance chamber amplified the seismic waves which peaked after 7 or 8 minutes. b) The resonance chamber sustained the seismic waves for over 55 minutes. This structure is believed to have resulted from the fractional crystallization of a magma ocean shortly after its formation about 4.5 billion years ago. The energy required to melt the outer portion of the Moon is commonly attributed to a giant impact event that is postulated to have formed the Earth-Moon system, and the subsequent reaccretion of material in Earth orbit. An alternate approach to resolving the problems of the Lunar KREEP deposits is to assume they arrived From Above in the form of dust and sand from Atomic Comets. a). 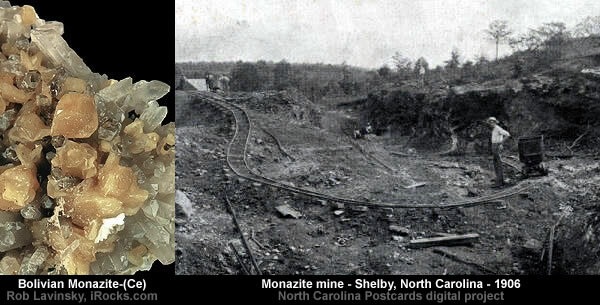 The Lunar KREEP minerals in the sands of the Sea of Showers display remarkable similarities to the Placer Deposits containing Monazite found on Earth in the Carolinas. It is often found in placer deposits. b). It appears unlikely Atomic Comets have directly impacted the Nearside of the Moon whilst it’s been shielded by the Earth. c1). When the Moon’s orbit causes it to travel through a Cometary Dust Tail or Gas Tail. c2). When Cometary debris is transferred from the Earth’s Upper Atmosphere via the Earth’s Magnetotail when the Moon is close to Full Moon. The Moon’s Sodium Tail demonstrates the Earth’s Magnetosphere remarkable ability to focus an inbound stream of charged particles which become concentrated in the core of the Magnetotail. A magnetosphere is the region of space surrounding an astronomical object in which charged particles are controlled by that object’s magnetic field. Opposite the compressed magnetic field is the magnetotail, where the magnetosphere extends far beyond the astronomical object. It contains two lobes, referred to as the northern and southern tail lobes. Magnetic field lines in the northern tail lobe point towards the object while those in the southern tail lobe point away. The tail lobes are almost empty, with few charged particles opposing the flow of the solar wind. The two lobes are separated by a plasma sheet, an area where the magnetic field is weaker, and the density of charged particles is higher. 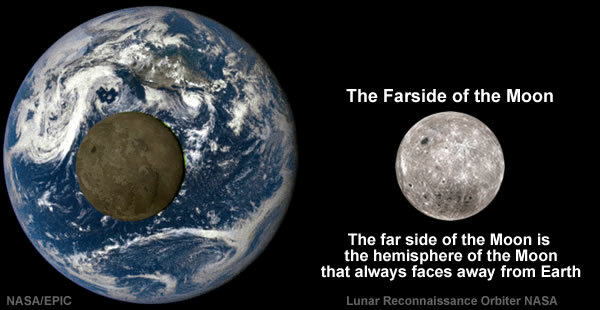 Arguably, most of the sandy Lunar KREEP deposits arrived via the Earth’s Magnetotail and were primarily deposited [often in an oxidised state] into the Ocean of Storms which forms the Moon’s leading edge as it moves towards Full Moon. 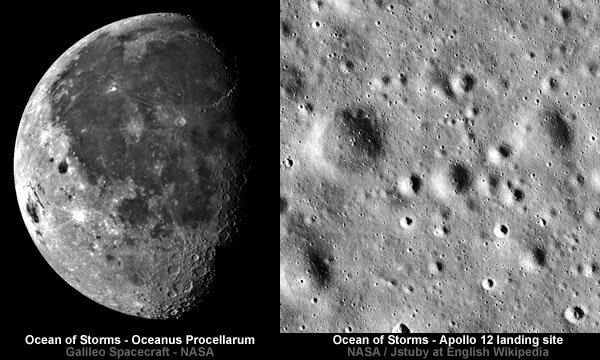 Oceanus Procellarum (Latin for “Ocean of Storms“) is a vast lunar mare on the western edge of the near side of the Moon. Unlike the other lunar maria, however, Oceanus Procellarum may or may not be contained within a single well-defined impact basin. There are several hypotheses about the origin of Oceanus Procellarum and a related asymmetry between the near and far sides of the Moon. Gallery | This entry was posted in As Above So Below, Astrophysics, Atmospheric Science, Atomic Comet, Catastrophism, Comets, Earth, Geology, Moon, Science, Solar System. Bookmark the permalink. Great post as always Tim. Saw this pop up the other day viz. Vikings and Arabs again.